Delicately cleanse and scent your skin with the Roger & Gallet Fleur de Figuier Perfumed Soap Set. Crafted using the traditional Roger & Gallet method of cooking the soaps in a cauldron, the Master Soap Makers take pride in every step of the soap making process. Perfumed right through to the core with the delightful Fleur de Figuier fragrance, the 100% plant based formula ensures ultimate softness on the skin. Each of the three soaps is wrapped using a sun-shaped pleated silk paper proces, and arrive tucked side by side in a beautiful box. 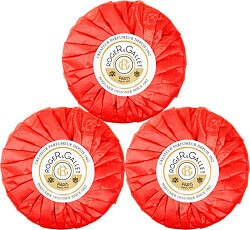 Roger & Gallet Fleur de Figuier Soaps x 3 100g is rated 4.8 out of 5 by 4. Rated 4 out of 5 by LoveBeauty86 from Lovely,feminine smell.Lather is good,smell lingers for a little while.I keep some in my wardrobe and every time I open it flowery smell hits me back. Rated 5 out of 5 by Kitty1 from Excellent quality Lovely soap and fresh scent, lasts well and doesn't disintegrate like some soaps tend to. Rated 5 out of 5 by Gisele from Super soap I love the gorgeous soaps from the Roger & Gallet range but I particularly love this fragrance. It's not sweet or cloying but equally it's not too sharp or zesty. As the soap lathers up, it releases a lovely woody note which lingers on and makes me smile.